MMFF 2013 is now on its 14th and final day today, January 7, 2014. 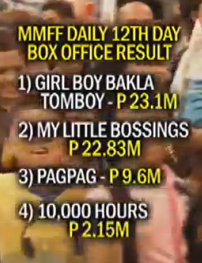 Which movie will emerge as the festival top grosser: "My Little Bossings" or "Girl Boy Bakla Tomboy"? The battle for the title is still so tight between the two comedy films as the 39th Metro Manila Film Festival comes to a close today. According to MMDA chairman Francis Tolentino in his TV Patrol interview yesterday, Jan. 6, Vice Ganda's movie "Girl Boy Bakla Tomboy" was able to grab top spot from the Ryzza Mae Dizon-Bimby Yap movie "My Little Bossings" in the box office last Sunday, January 5, 2014, the 12th day of the festival, something it already did during the film fest's 3rd or 4th day. "Girl Boy Bakla Tomboy" earned a gross earnings of P23.1-million during Day 12, but "My Little Bossings" kept close in 2nd with P22.83-million, just a P270,000 difference. Kathryn Bernardo-Daniel Padilla movie "Pagpag" took 3rd slot with P9.6-million, while the Robin Padilla movie "10000 Hours" which won the most trophies during the awards night was able to climb up to 4th, with P2.15M gross income, beating "Kimmy Dora: Ang Kiyemeng Prequel" which dropped to 5th. 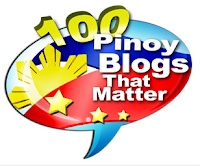 However, when total grosses from Day 1 to 12 are tallied, "My Little Bossings" still leads in the ranking, and "Kimmy Dora 3" still stands higher than "10,000 Hours". Total collection of the festival after 12 days is now a record P934-million, according to Tolentino. Adding grosses from the last 2 days of the festival, the final tally might reach P1-billion, or at least close to it. Both "My Little Bossings" and "Girl, Boy, Bakla, Tomboy" have already surpassed P350-million as of Day 13 of the filmfest, while "Pagpag" is now the highest-grossing horror film ever in the history of MMFF with over P130-million, beating the previous record set by the 2011 MMFF horror entry "Segunda Mano".